1.I started with varying the long tail chains. First row has stitches worked at an angle. Two stitches are worked at opposite angles, thus crossing them in the end in the second row. Three stitches are worked in a pattern in the third row. The length of the tails are worked alternatively long and short in the fourth row, with crosses on longer tails. 2.Long tail chains worked in metallic thread are worked with woven long tail chain in the first row. 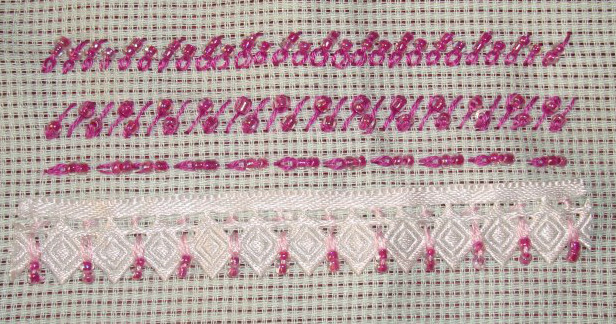 The ends are whipped with rimjim thread like Pekinese stitch in the second row with the help of small straight stitches. Two rows of long tailed chains are laced with same rimjim thread, like wave filling in the third sample. 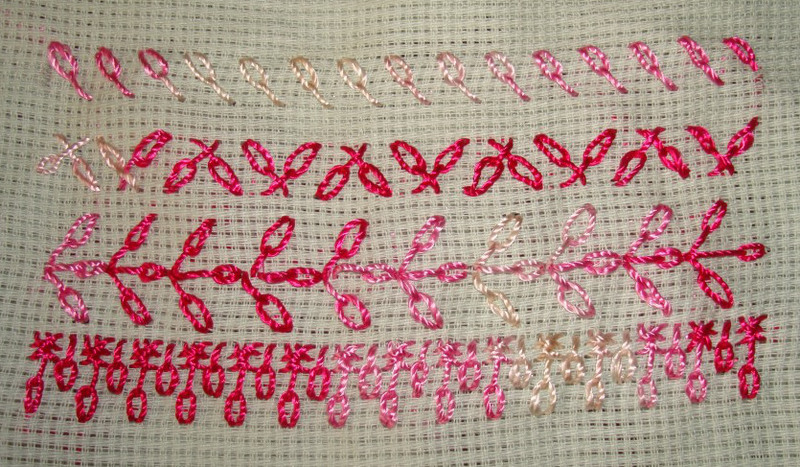 3.Detached chain stitches were used with other TAST stitches in previous samplers. The long tail chains are worked with a few stitches- herringbone, buttonhole, feather [I like this one] and fly stitch variation. 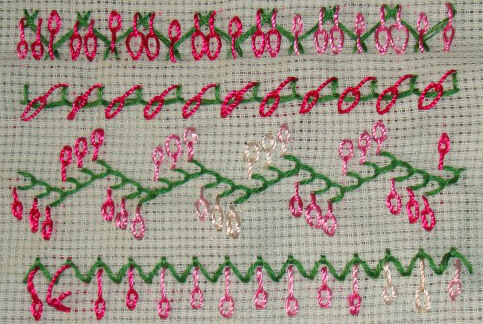 4a.Long tailed chain stitches were worked to form the band for Portuguese border stitch. 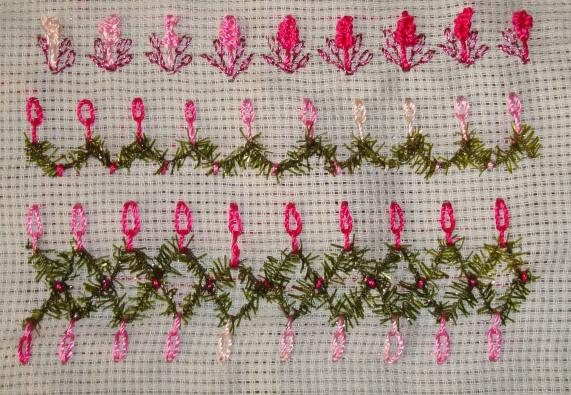 4b.portuguese border stitch worked over the long tailed chains in the first row. Five long tailed chains are tied together [like sheaf stitch] in the second row. 5.I started the beaded version by alternating single and double beads in the first row. The chains are worked over the beads in the second row. It was hard to work continuously with long tail chains, still the stitches are worked one after another in the third row. Long tailed chain worked over white lace in the last sample. A simple stitch to work with, and very useful for embellishing.